The title of his new book describes just how close the Boston Red Sox came to winning the World Series in 1986. Lou Gorman, who recently released "One Pitch from Glory: A Decade of Running the Red Sox," was Red Sox general manager from 1984-1993, and presided over the team that came within one strike of winning it all. "It was remarkable because I had just come from the Mets and had joined the Red Sox in 1984," said Gorman. "Most of the players there, Dwight Gooden, Darryl Strawberry, Lenny Dykstra, Kevin Mitchell and on and on I had been involved in signing or drafting. It was a club I knew in depth and well. "We were one pitch away from winning it all. We were ready to head into the clubhouse and the World Series Trophy was sitting there. The Mets had just flashed on the board 'Congratulations Red Sox World Champions.' I remember turning to my wife and saying remember this moment we are about to make Red Sox history. "All of a sudden a passed ball, the game is tied and the ground ball to (Bill) Buckner and suddenly we lost the game. It was like I was shot dead. It was one of the most tragic losses in World Series history." During his tenure as Sox GM, Gorman led the led the team to three postseason appearances, including Eastern Division titles in 1986, 1988 and 1990. The club set season attendance records four times and drew more than 2 million fans eight straight years. These days, the 76-year-old Gorman remains with the Red Sox as the executive consultant for public affairs with an emphasis on community projects. He is also the coordinator of the Red Sox Hall of Fame, of which he became a member in 2002. Outside of the Red Sox, Gorman is currently promoting his new book, which he decided to write because he wanted to share his behind-the-scenes experiences. "This is a book for a Red Sox fan," Gorman said. "The reviews on it have been exceptional. We have already blown through the first printing and just about have the second printing sold. I have been surprised that the reception has been so good." Interestingly enough, Gorman, who is currently in his 42nd season of baseball, had so many interesting stories to tell that a decision was made to publish a second book, which is scheduled to be released in the fall. "This is my 42nd year in baseball and had 41 years in baseball at that point," Gorman said. "I wanted to just go back and talk about my years in baseball. I won a World Series with the Baltimore Orioles in 1966 when I was the director of player operations. I began two expansion clubs (Kansas City Royals, Seattle Mariners) and no one in history has ever begun two expansion clubs on the baseball operations side. "I began writing it and wrote 3,000 pages in long hand on a legal pad. By the time the manuscripts were typed it ended up being 600-some pages. When the editors got it they said it was too big. The decision was then made to make two books." Gorman currently resides in Weston with his wife Mary Lou of 41 years. Gorman grew up in New England as a Red Sox fan and attended Stonehill College, where the baseball field on campus is now named after him. Being a native New Englander, Gorman knew first-hand that serving as general manager of the Red Sox was one of the toughest positions in baseball, especially with all of Red Sox Nation thinking they are GMs in training. Every decision is dissected thoroughly by the fans and the media. 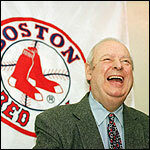 "Baseball in Boston is a passion," said Gorman. "Part of the culture growing up in New England is being a Red Sox fan. Red Sox Nation is like no other fandom in the world. They love the Red Sox and live and die with the Red Sox. The media coverage is so intense and so comprehensive like no other place I have been. Everything you do is analyzed and reanalyzed and critiqued. The pressure is enormous and they want to win now." To this day, Gorman is still criticized for trading away then-prospect Jeff Bagwell to the Houston Astros for reliever Larry Anderson in 1990. "I get criticized for the Bagwell trade and probably always will be," said Gorman. "He turned out to be a great player. To me it was a question about trying to win now. We had a chance to win the division, play Oakland and go back to the World Series." Gorman thinks current Sox GM Theo Epstein is doing an incredible job. "Theo Epstein did an absolutely brilliant job in putting together a world championship club and deserves all the accolades," said Gorman. "He handles the press well and stays low key. His decisions have been good and trading Nomar Garciaparra took a lot of guts. Nomar was an icon and a great player. He did it and it ended up being a great move that helped us win the World Series." As far as being a part of the last season's World Series championship, Gorman finally witnessed what he wanted to see back in 1986. "When the final out was made I turned to my wife and said eighteen years ago we nearly made Red Sox history, but tonight we saw Red Sox history being made." CLAIM TO FAME: Served as Red Sox GM from 1984-1993, leading the Red Sox to three postseason appearances, including the 1986 World Series. The other two were ALCS appearances in 1988 and 1990. DID YOU KNOW? : Gorman drafted Roger Clemens when he was with the New York Mets, but the team did not sign him. BEST GENERAL MANAGER IN BASEBALL: John Schuerholz (Atlanta Braves), although I have to say Theo Epstein did a brilliant job last year. CLAM CHOWDA OR LOBSTA? : I love Clam Chowder. I could eat Clam Chowder five times a week. WILL THE NHL START ON TIME NEXT SEASON? : I think so. I think they will get a salary cap worked out. 2005 PICK TO WIN THE WORLD SERIES: I think the Red Sox have a chance to repeat. I really believe that.